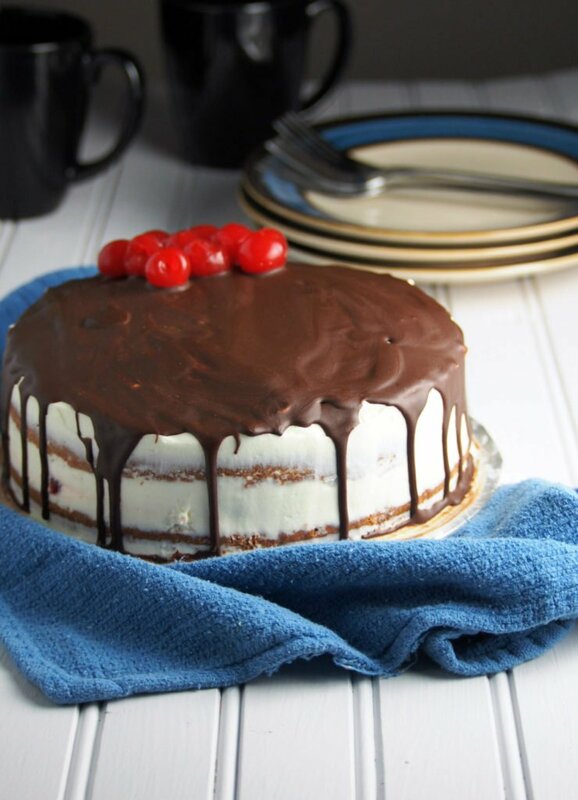 A light vanilla cake filled with maraschino cherries , frosted with creamy white chocolate ganache and finally topped with drippings of semi sweet chocolate. This white chocolate cherry cake is a cake lover’s dream. I decided on making this cake because this past weekend was my Aunt’s birthday dinner, and it was also Thanksgiving weekend here in Canada. There can’t be a more perfect time to bake a cake! Days before baking day, I was already over the top excited because I love white chocolate ganache. I first made white chocolate ganache frosted cake back in the days when I was just starting to bake. I really loved it then, I think I ate the entire 6 inch cake ( not in one sitting of course!). 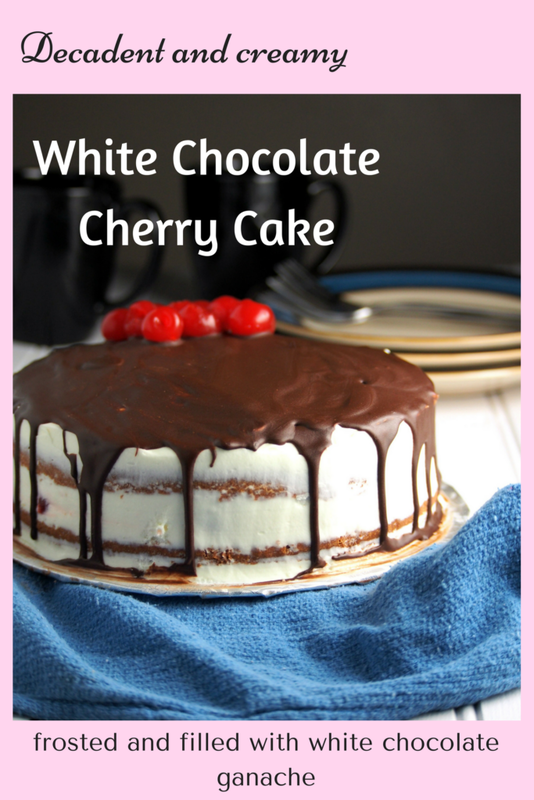 This white chocolate cherry cake is made of a perfect white vanilla cake. I love how easy and fast it was to make it. 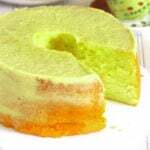 This cake uses only the whites and not the yolks of eggs. It is a good thing that I have a carton of pasteurized egg whites in the fridge because I didn’t have to worry about what to do with the egg yolks after. The important thing in this recipe is that the milk and the egg whites should be in room temperature, and the butter should be soft but not warm to the touch. I made sure of that by measuring these three ingredients ahead and placing them in the counter, Then I went to prepare the rest of the ingredients. The white chocolate ganache is pretty easy too. You just heat the heavy cream to the point before it reaches the boiling point. This is when the surface of the cream starts to make waves but not yet bubbling. The heated cream is then poured over the chopped white chocolate.We are basically melting the chocolate with the hot cream. The resulting mixture will be thick but still fluid and not yet spreadable. Once smooth and melted, I lay a plastic wrap on the surface of the ganache, as in the plastic should come in contact with the entire surface. This prevents a film of solid to form on the top of ganache. Then once cold, I just whisked the ganache to stiff peaks until it is thick and spreadable. For the chocolate syrup drip, the important thing is to make the syrup runny. I made the mistake the first time when I didn’t add vegetable oil to the melted chocolate. I thought it was runny enough and that it will drip down the cake. But it turned out it was not thin enough and the syrup stayed on the edge of the cake and didn’t drip! So I would recommend adding the vegetable oil in small amounts, just until the syrup is thin enough that it runs down back to the bowl in smooth continuous manner when you use a spoon to test it. Also as a prep before doing the glamorous chocolate drip to the cake, it is very important that the cake be chilled in the fridge after being frosted. This will ensure that the warm chocolate syrup will set as soon as it makes contact with sides of the cold cake. Otherwise, the warm syrup will melt the ganache and you will end up with a messy but still delicious cake! So don’t forget, refrigerate the cake after frosting it! For icing, filling and also for pouring the chocolate drip down the sides of cake, I recommend using a cake turn table for a breezy and convenient process. It really makes the job faster and easier. It is a must when decorating any cake so you will not end up rotating around the cake while decorating! And that’s about it! That is all there is for you to make this white chocolate cherry cake. Let me know how you like it! 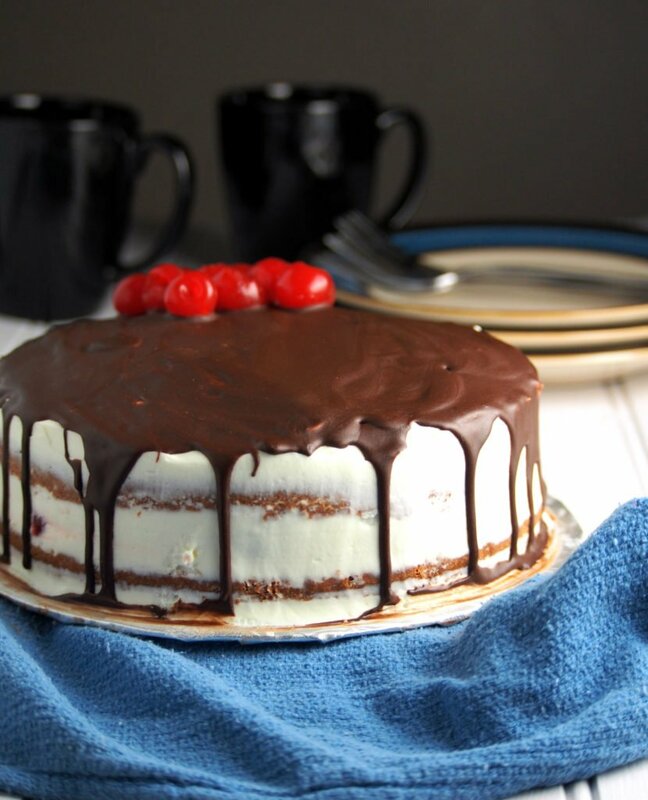 A light vanilla cake filled with maraschino cherries, frosted with creamy white chocolate ganache and finally topped with drippings of semi-sweet chocolate. This white chocolate cherry cake is a cake lover’s dream. Make sure the egg whites and milk are in room temperature by measuring them ahead. Preheat oven to 350 F. Grease the bottom of two 9 inch baking pans and line them with parchment paper. Grease the parchment papers and the sides of the pans. Dump a little amount of flour on the baking pans and tilt the pans around to lightly cover the insides with flour. Tap the base of the pans to remove the excess flour. Combine egg whites , vanilla extract and milk in a bowl and stir using a fork to combine. Combine flour, sugar, salt and baking powder in the bowl of a stand mixer. Using low speed, run the mixer to combine the dry ingredients. Add the cubed butter and continue beating for about a minute and a half. Adjust the speed of mixer to medium. Add ½ of the milk mixture and continue mixing for about 1 and ½ minutes. Add the remaining milk mixture and continue to mix for about a minute. Pour the batter into the prepared pans and bake for 25-27 minutes or until a toothpick inserted into the middle of the cakes come out clean. Cool cake for ten minutes, then turn them over on a wire rack to cool completely. Add the chopped white chocolate in a medium mixing bowl. In a medium saucepan, heat the cream over medium heat just before it reaches the boiling point. You should see the surface of cream is starting to make waves but not bubbling. Pour the cream over the chocolate and let stand for about 3-5 minutes, The chocolate should be covered by the cream entirely. Using a rubber spatula, mix the mixture until all the chocolate are completely melted. Let the ganache cool while occasionally whisking with a wire whisk.Cover the surface of the ganache with plastic wrap ( Let the plastic touch the entire surface of the ganache. This prevents a film to form in the surface). Refrigerate for at least 2 hours. When the ganache has cooled down completely, beat it using either a stand or hand mixer until the ganache forms stiff peaks and is thick. Spread a little amount of ganache on the center of the dish that you are using for serving the cake.This will serve as an adhesive to keep cake in its place while decorating. Lay first layer of cake on your serving dish or base. Spread ganache over the first layer and even it out. 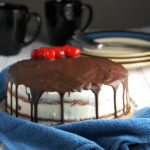 Top with cherries and spread another thin layer of ganache. 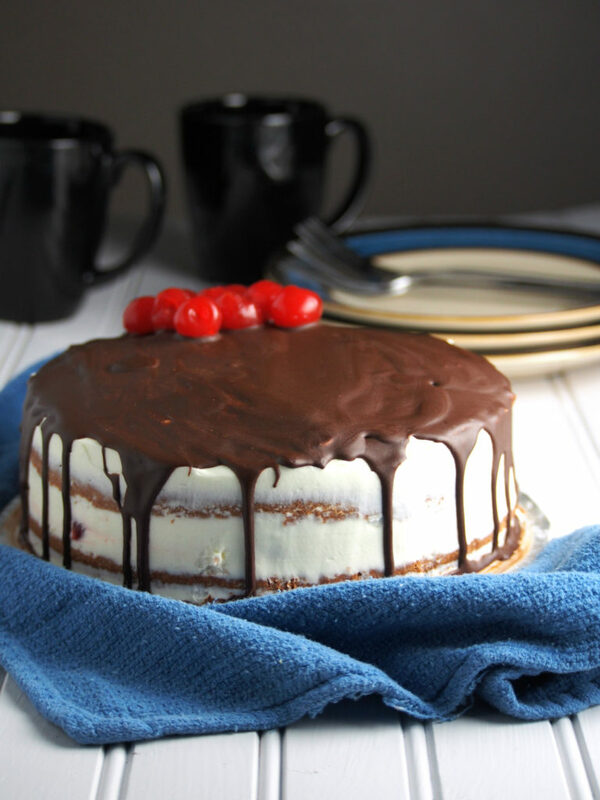 Lay the second cake over the cherries and ice the entire cake with the ganache. Refrigerate cake for at least 2 hours. Melt the chocolate in a microwave safe bowl, 30-40 seconds at a time. Repeat until the chocolate start to become shiny and soft. Be watchful, chocolates still hold their shape even if they are completely melted, tricking you to heat it up more. Touch the surface often, if is is soft, it is ready. Use a whisk or fork to stir the chocolate until it is very smooth. Add about a teaspoon of cooking oil to the chocolate, and add another teaspoon gradually until it becomes flowy and runny but not very thin. 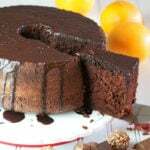 Using a glass with a spout or a spoon, pour chocolate syrup around the edge of the cake and use the back of the spoon to make it drip down the sides. 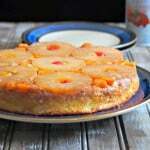 It is important that the cake has been chilled in the fridge so that the syrup will begin to set as it drips down the sides of cold cake. Gently spread the chocolate syrup on the entire top surface of cake using the back of spoon. Top with cherries. 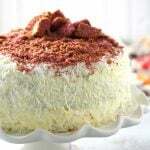 Keep cake refrigerated in a sealed cake container. Vanilla cake recipe adapted from I am Baker. This post contains affilate links. See disclosure page to learn more.